In Tunisia, representatives of 70 nations are trying to find ways to pressure Syria into accepting a ceasefire, to allow humanitarian access, and to show support for Syria's opposition. But it's in Beijing and Moscow, far away, where the power to end Syria's bloodshed really lies. So far China and Russia have provided the diplomatic support that has shielded Syria from international pressure. Some say their actions have emboldened the regime of Bashar al-Assad in Syria to believe it can act with impunity. They are the two major powers that have blocked efforts in the UN Security Council and the Arab League to force Syria to halt its military offensive against its own people. They have vetoed UN resolutions and stalled efforts to condemn the actions of the Assad regime. Russia has clear interests in Syria. It has long given military and diplomatic support to the Syrian government. It supplies Syria with many of its guns, tanks and shells. If the Assad regime fell Russia would lose much of its influence in the Middle East. Much harder to explain is why China has taken the same line, and why it continues to stand so firmly against tougher action over Syria. China does not have direct interests at stake in Syria in the same way that Russia does. It does not sell Syria many weapons or rely on it as an ally. In fact, standing up now puts China in an uncharacteristically exposed position. China's diplomacy is usually about keeping a low profile and leaving others to take the lead. So what is China's motivation? There are many theories. First is the explanation that China itself gives, publicly at least, that it has a long-standing policy of non-intervention and is sticking to that. But this is not easy to square with the fact that China actively decided to veto the UN resolutions. It didn't need to use its blocking power. Russia seemed set to frustrate action at the UN anyway. 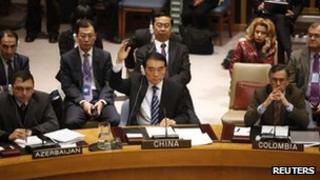 China could have left Russia to veto action, and allowed the resolution to fail without sticking its own neck out. Second is the explanation that this is a sign of China's growing assertiveness - that China is starting to stand up for what it believes in. But China's veto has left Beijing open to criticism that it sides with dictators and repressive regimes and is encouraging Syria's crackdown. So this would be an odd issue to choose to make a stand over. Third is the idea that China and Russia were outraged by what happened in Libya - where they allowed a UN resolution imposing a no-fly zone but then saw it used by Western powers to bring down the Gaddafi regime - and don't want a repeat of that experience. But this also doesn't stand up to much scrutiny. China's diplomats at the UN are said to be some of its best. The idea they were blindsided and failed to realise that the UN resolution would bring Gaddafi under enormous pressure makes them look foolish and hardly seems credible. Even if it were true, it does not explain why China has blocked new UN resolutions that explicitly do not allow for intervention. Fourth is the possibility that China is worried that radical Islamic groups are backing the uprising in Syria. Beijing may be concerned that their influence could end up spreading down the old Silk Road to China's own Muslim populations in Xinjiang. This is certainly a concern for China but probably not enough to shape its whole policy towards Syria. Fifth, and plausible, is the fact that China along with Russia, both authoritarian states themselves, are concerned about the way repressive regimes have been falling in the Arab Spring. Both Beijing and Moscow have shown they are concerned about the ripples from the Middle East, and both believe the UN Security Council has been used to help topple regimes the West does not like. So backing Syria may be a way of trying to stop the dominoes falling. The weakness with this argument is that the Assad regime may be doomed already. When the man expected to be China's next president, Xi Jinping, was in Washington this month, the Obama administration told him that China risks being on the wrong side of history over Syria. China could see its standing in the Middle East badly damaged. China's stance has already left it quite isolated. In the UN General Assembly this month, 137 nations voted to back the Arab League's plan to end the Syrian crisis, while only 12 nations, including China, opposed it. Arab nations have implored China to back them but it has declined to. So the final explanation is that Beijing is acting alongside Moscow as a deliberate choice, building a coalition of interests. Russia, with its bigger stake in Syria, may have sought China's help. China may have calculated that to abstain in the UN would have left it open to criticism anyway, and it is better to take an active position alongside Russia. China may now be in a position to ask Russia to return the favour at a later date, perhaps over North Korea. Beijing's Global Times newspaper, linked to the ruling Communist Party, said in Friday's editorial: "What's important is that China co-ordinates well and maintains a tacit understanding with Russia on this issue. "The issue of Syria has so far added points to the quality of strategic co-operation between China and Russia, and this should be seen as China's achievement in a difficult environment." Civilians are continuing to die in Syria in their dozens. To say that China's achievement has been building closer ties with Russia implies that China's diplomacy is not at all about principles and protecting civilians in a far-off nation, but about hard-headed self interest. If that's true, don't expect China to change course over Syria any time soon. In Homs, every few seconds, at the height of the daily bombardment, Syrian government forces are firing rockets and shells into civilian areas. Across Syria, every day, men, women and children are dying as Bashar al-Assad's regime struggles to put down the uprising against it.